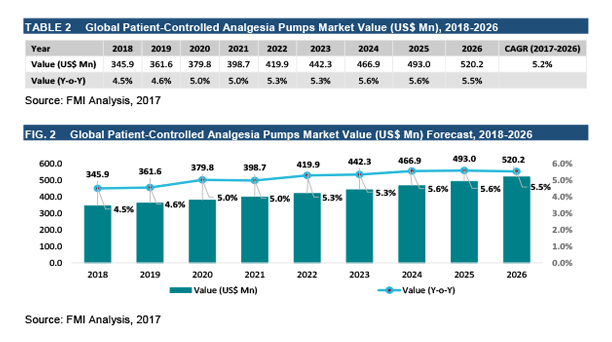 FMI forecasts the Global patient-controlled analgesia pumps market to grow from US$ 330.9 Mn in 2017 to US$ 520.2 Mn in 2026. This represents a compound annual growth rate (CAGR) of 5.2% from 2017 to 2026. 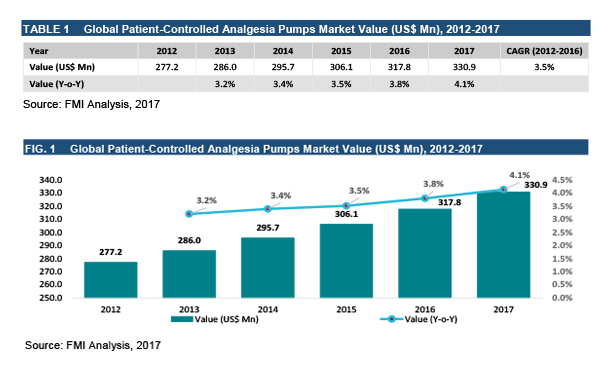 Among the global patient-controlled analgesia pumps market's product type, the largest is PCA Pumps, which represents US$ 315.2 Mn of the market, or 95.3% in 2017, and US$ 498.2 Mn in 2026, or 95.8%, and a CAGR of 5.2%. It is growing at US$ 36.6 Mn annually over the course of the forecast period, and this absolute growth is larger than the any other segment. The largest share is contributed by Hospitals segment in Global Patient-Controlled Analgesia Pumps market. This represented US$ 133.9 Mn, or 40.5% of the market in 2017, to reach US$ 202.3 Mn in 2022, or 38.9%, representing a CAGR across forecast period of 4.7%. FMI forecasts the Pediatrics/Neonatology patient-controlled analgesia pumps segment to grow from US$ 28.5 Mn in 2017 to US$ 44.6 Mn in 2026. This represents a compound annual growth rate (CAGR) of 5.1% from 2017 to 2026.